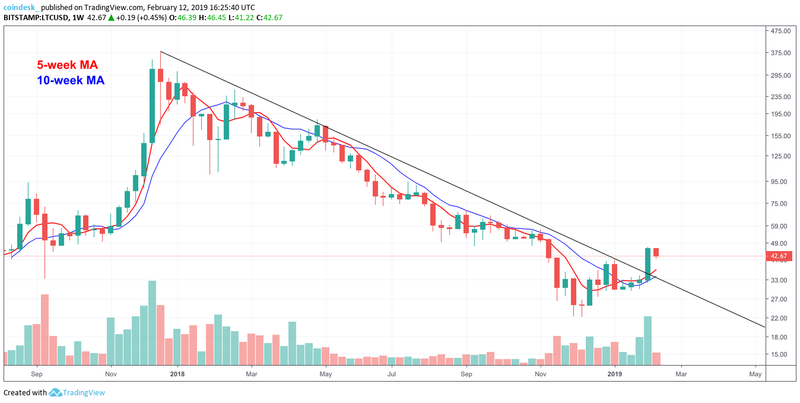 Litecoin has rallied sharply in the first six weeks of 2019, triggering speculation that investors may be pricing in a supply reduction that’s scheduled to occur in August. The world’s fourth largest cryptocurrency by market capitalization is currently trading at $44, having clocked a high of $47 last week. At that price, LTC was up 56 percent on a year-to-date basis, according to CoinMarketCap data. LTC picked up a bid near $20 in December, tracking the corrective rally in bitcoin – the world’s largest cryptocurrency by market capitalization. Both moved pretty much in unison in January. Things, however, changed last week, with LTC outshining BTC’s 7 percent gain with a 41 percent rise. LTC’s strong performance comes at least five months ahead of the mining reward halving, or the time at which the amount of litecoins produced as a network subsidy for each transaction block falls is cut in half. On Aug. 8, the mining reward will be reduced from 25 LTC to 12.5 LTC. Markets are always forward-looking and hence could be pricing in the impending supply drop. Validating that argument is historical data, which shows that the cryptocurrency had rallied in the months leading up to the first mining reward halving, which took place on Aug. 25, 2015. 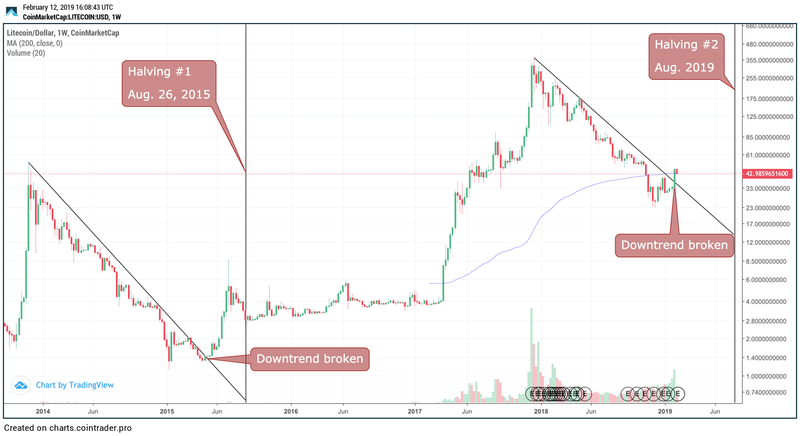 Litecoin’s performance in 2014-2015 and 2018-2019 As seen above, LTC carved out a long-term low at $1.12 in January 2015 and rose to a high of $8.72 in July before falling back below $4.00 ahead of Aug. 25 – a day when mining rewards fell from 50 LTC to 25 LTC. So, it could be said that markets bought LTC in seven months prior to reward halving and booked profits a few weeks before the event. The chart also shows that the cryptocurrency exited the bear market (long-term falling trendline) well before the reward halving. Litecoin’s recent surge is reminiscent of the price action witnessed in early 2015. As noted earlier, the cryptocurrency has appreciated by more than 50 percent in the six-weeks and has crossed the 12-month-long falling trendline. History seems to be repeating itself and so LTC could spend the next couple of months trading in a sideways manner before seeing a possible gear-shift in June and July. Such a possibility is also pointed to in the price chart analysis. LTC closed last week at $46.30 on Bitstamp, confirming a bullish higher high and higher low pattern. The 5- and 10-week moving averages (MAs) are also trending north, having produced a bullish crossover in mid-January. The move through the long-term trendline hurdle was backed by a jump in trading volumes to the highest level since February 2018. The bearish-to-bullish trend change, therefore, looks legitimate. Litecoin isn’t the only cryptocurrency to undergo a reward halving roughly every four years. In fact, so does the world’s largest cryptocurrency, bitcoin. 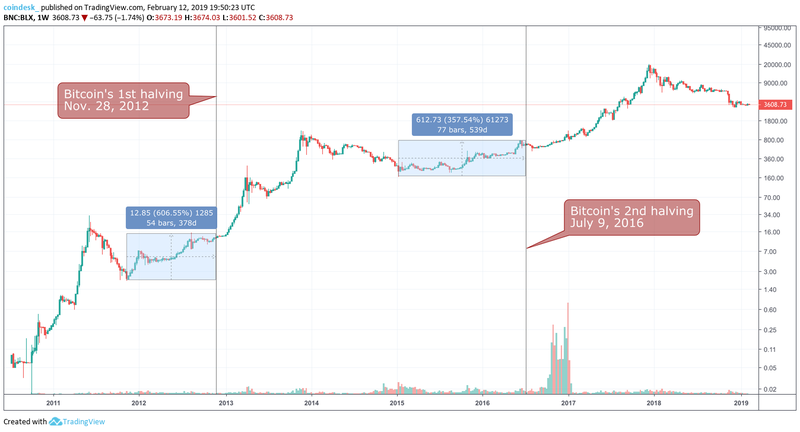 Since bitcoin’s inception 10 years ago, the cryptocurrency has experienced two reward halvings, the first on Nov. 28, 2012 and second on July 9, 2016, and is estimated to undergo a third in May of 2020. As seen in the chart above, both halvings were preceded months in advance by significant price growth and full-fledged bull markets after the event. Upon close inspection, it’s clear the halvings elicit a brief “sell the news” reaction from the market in the weeks leading up to the event. In that time, bitcoin witnessed price drops of 30-50 percent, which is comparable to litecoin markets in the few weeks leading up to its first halving.